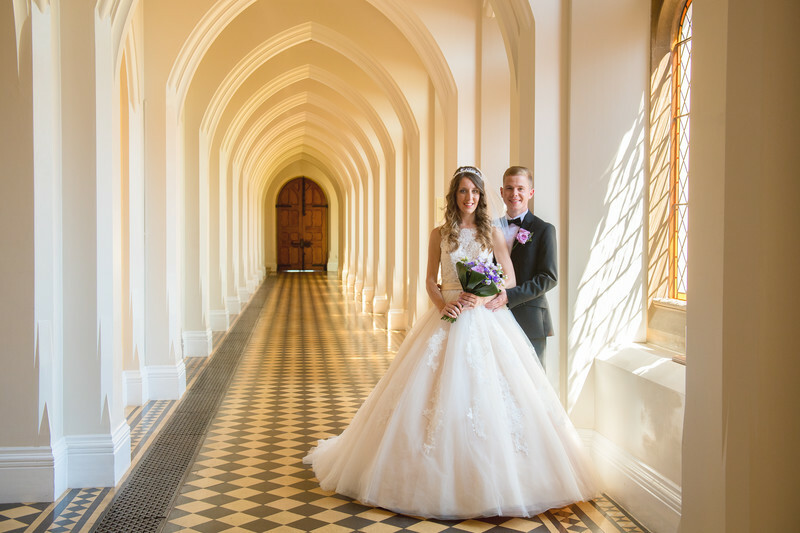 Rebecca and Ryan got married at Stanbrook Abbey in Worcestershire. This is one of my favourite documentary wedding photos taken during their wedding. Earlier in the day, immediately after the wedding ceremony in the Callow Hall, we had taken the formal group photos outside, as well as a few photos of the newlyweds. The sun was extremely bright and powerful, and being in the middle of summer, the sun was directly over head too. This doesn't make for the most flattering photographs, so I decided that we would take the remainder of the couple's photos after the wedding breakfast, when everyone had had time to relax, and the sun was lower in the evening sky. We had just left the Thompson Suite where the wedding breakfast had been served, and I was about to get ready to take the photo you see above, when one of the wedding guests came out of the suite, and without warning, lifted Rebecca's wedding dress in order to look at her garter. It took everyone completely by surprise, as you can see from Rebecca's reaction, but also that of her husband too. The black and white conversion was important for this photo - As you can see from the image directly above, the evening sun was creating this gorgeous golden light that lit up the cloisters perfectly for this particular photo, but that same golden light also took focus and attention away from the moment that I had captured in the main photo.